This item is out of stock. If you are interested in this item, please send us an email at info@koolerdesign.com and we will notify you when it becomes available. You can add it to your cart now, so it will be waiting for your order. 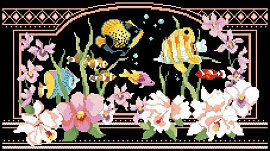 Dramatically stitched on black fabric, this tropical underwater scene will put you in paradise. With bright tropical angel fish and gorgeous orchids in the foreground, this elegant design is mesmerizing to look at and delightful to stitch. Contents: Stitch Count is 223w X 123h Finished size on 14ct 16" x 9"